Whether you have a small or big screen, you know that too many open windows make computation rather awkward – windows overlap each other, hide behind desktop edges, get out of sight, so that the user can even forget that an application is open. Snapping is an excellent way to keep your desktop organized. 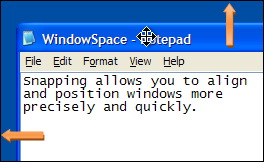 The snapping feature is enabled when you move or resize a window with the mouse. Once this feature is enabled, windows will snap to each other or to the screen borders neatly, edge to edge, rather than block or cover one another completely. You’ll be able to align windows properly without having to reposition them constantly on the desktop, or hunt for the application you need behind other windows. When you resize a window with the mouse, snapping allows you to quickly make two or more windows the same width or height. Snapping makes window management a thousand times easier, especially for the owners of large displays, widescreens and multi-monitor systems. Using this feature, you can easily line up misplaced windows to bring order to your desktop workspace. It’ll take you less than a second to set any window to its position, and make good use of every single pixel of your workspace. 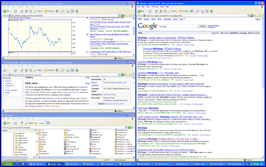 WindowSpace makes it a true delight for the computer user to manage multiple windows and avoid window overlapping that comes as a result of multitasking. If you need to temporarily disable the snapping feature, press and hold down the ALT key while moving or resizing a window. Window snapping works fine for most of the applications, including many of those that use skins and non-standard shapes, such as Windows Live Messenger, Windows Media Player, Microsoft Office 2007 and many others. 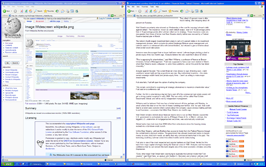 WindowSpace supports various Windows XP themes, as well as the new Aero style of Windows Vista. WindowSpace runs under Microsoft Windows 2000/XP/Vista and newer operating systems. Please note you’ll need to download WindowSpace 64-Bit Edition to take advantage of window snapping if you have a 64-bit version of Windows. 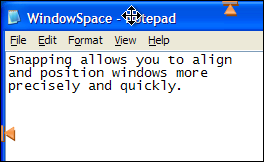 Note that window snapping for console applications (cmd.exe and other) works only on Windows 7. Older versions of Windows don't support this feature.